Round gold wired framed glasses with colored lenses. 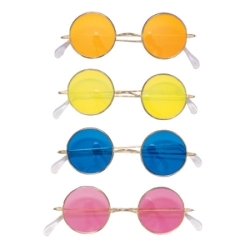 These glasses are perfect for hippies and other psychedelic characters from the 1960’s and the 1970’s. Lenses come in assorted colors.